You don’t want to touch the data/configurations of the production account of your client and you don’t have access to the Sanbox account. Or, you want to develop a SuiteApp as a product rather than for a particular client. NetSuite offers a Community SuiteCloud Developer Network account for free . Are you a shortcut addict? Feel uneasy to move the mouse to much and always find ways to reduce number of clicks and key presses? Then this tip should work great for you. As a result your frequent navigations are shortened. For instance “Setup > Customization > Scripts > New”, accessible by searching for “script” and “Document > Files > File Cabinet”, by typing “fil”. Its often painful to make changes to scripts on our machine and then upload them to File Cabinet, before you can see the script running. This becomes even more harsh if the changes is as short as one character. 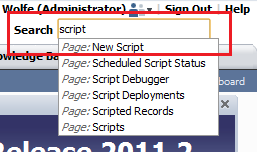 In such a scenario, use the Script Debugger. Make changes online and debug it right within your browser. Keep in mind that the process would require some patience because of back and forth calls between NetSuite and the web browser. Code Auto-Completion is a great feature. However, there is little help offered by IDE’s in case of loosely typed languages like JS. If you like to get some help with auto-complete, download SuiteScript API from NetSuite File Cabinet. This is a JS file you should add to your project with other SuiteScripts. NetSuite Developer resources are a great way to develop for NetSuite. Whether you are a beginner or a seasoned NetSuite Developer, the SuiteScript Developer and Reference Guide specially serve good purpose. If you only have a background in software development and have no prior experience of working with ERPs/CRMs, you might find it handy to go through the basics of NetSuite ERP/CRM domain. Try out Netsuite for Dummies. This entry was posted on August 4, 2011, 7:56 am and is filed under Netsuite, Productivity. You can follow any responses to this entry through RSS 2.0. You can leave a response, or trackback from your own site.